Positioning thrusters is often as important as choosing the right thrust output when seeking maximum manoeuvring performance for your boat. Thruster turbines need to be placed one full propeller diameter under the water line to achieve optimum thrust. The thruster must also be positioned as far forward in the bow or as far back in the stern as possible. A thruster stepped back from the bow (or stern) would need to be more powerful than one mounted further forward (or back), to achieve the same turning effect on the boat. Most motor boat designs are well suited to fixed tunnel thruster installations. 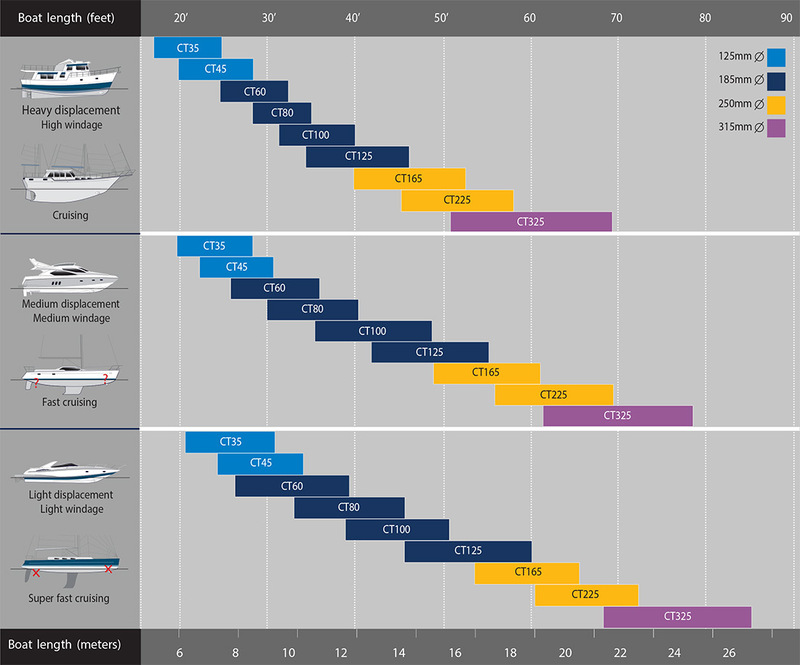 However, the above-described constraints (depth and positioning) often contradict each other, especially in modern sailing yachts. Although some sailing yachts can achieve good results with tunnel thrusters, most modern designs would work better using a retractable solution. The combined use of a bow and stern thruster adds a whole new level of control when maneuvering in difficult conditions or tight corners. Turning on the spot or even stepping the entire boat sideways becomes possible at the flick of a switch. Max Power offers stern thruster adapters for the entire tunnel thruster range. A range of Ignition Protected thrusters is also available thus enabling the use of a stern thruster in habitually damp zones or petrol-powered boats. On boats where conventional tunnel stern adapters cannot be used due to lack of immersion depth or the positioning of drive systems, retractable stern thrusters offer an attractive & powerful solution. Bow and stern thrusters whether retractable or tunnel require a power source. On a boat this can be either a 12/24V DC (electric) motor or a hydraulic motor. The hydraulic motor will need to draw power from a thermal engine (via a hydraulic pump) or a remote mounted DC motor (also via a hydraulic pump). The DC motor will draw power directly from a battery bank. The choice of power will depend on factors such as frequency of use, runtime required, and thruster size needed. Hydraulic thrusters need a carefully designed hydraulic system to run them reliably and efficiently. Often this system may only be required for the boat�s thruster(s). The most common form of thruster only system uses an engine as its power source. These can offer unlimited run times and do not need batteries or high power cables. Two types of hydraulic pumps can be used for these dedicated systems. 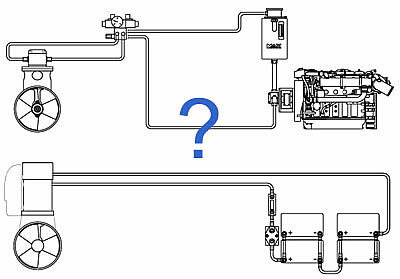 A variable displacement pump can be used when a fixed flow is needed but the engine RPM is likely to vary. This would typically be a main engine or gearbox mounted pump. Often used on large powerboats, these systems offer a powerful solution for larger thrusters. Used when a generator with a PTO (power take off) is available, fixed displacement pumps give a single (fixed) flow at a given engine RPM. Highly robust, these systems are simple to install and cost effective. Although still fundamentally a DC thruster, a hydraulic unit run from a DC power pack offers a host of advantages over conventional DC thrusters. such as a variety of oil tanks and control valves. In both cases Max Power can advise and assist in the design of an efficient system suited to your needs.